Tehran, May 15 (CHN) - The newly built 435 meter Milad Tower is predicted to replace the long-time symbol of Tehran, the Azadi tower. Experts are also suggesting for the registration of the Tower as an Iranian national heritage. Experts believe that the new tower will one day replace the today symbol of the capital of Iran, the Azadi Tower. They say it will take some time for people to get accustomed to the structure, gradually accepting it as the new symbol of Tehran metropolitan. The new concrete structure of Milad Tower which stands up 435 meter high on Gisha Hills of Tehran is reaching its final phase and will soon be completed. The Tower is considered the forth highest communication-broadcasting tower of the world and the first considering the vast functional structure on its top. Azadi Tower did not become the symbol of the capital by advertising or any special plans, explains a preservation expert, Eskandar Mokhtari, but rather by peoples' affection for the tower. "They stood next to the tower and took pictures, and those who traveled to Tehran from other provinces talked of the special tower in their return home," said Mokhtari. 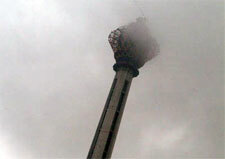 Mokhtari believes that Milad Tower will undergo the same process, in time becoming the new symbol of Tehran. Milad Tower which can be seen from any place in Tehran is located in a 70-hectare land, 17 of which is possessed by the tower and the rest will be given to a future five-star international hotel, an international communication center, conference halls, an information technology and commercial center, plus a museum allocated to the legacy of the Islamic Republic of Iran. According to executive manager of the Yademan Sazeh Company which is in charge of constructing the tower, Mohammadhasan Nazarpour, the project is not only going to include tourist facilities, but also is to replace the Azadi Tower as the symbol of the Iranian capital. It is moreover proof of the Iranian engineers and scientists' expertise. Azadi Tower has long been known as the symbol of the Iranian capital, but despite its being registered as a national heritage and having the special attention of the Iranian Cultural Heritage and Tourism Organization (ICHTO), today it breathes heavily amidst the Azadi Square traffic jam, air pollution, and improper maintenance.